Dayton Memorial Park Cemetery is a modern interment park. A high standard of efficiency as well as the protection of the Interment Right Owner* has resulted in the creation over time of “Conditions and Restrictions” which control and govern the use of every location in Dayton Memorial Park Cemetery (Cemetery). These “Conditions and Restrictions” are periodically reviewed, revised and approved by the Cemetery Board of Trustees. While some may appear arbitrary, each, however, has been adopted for the specific purpose of protecting and insuring the rights of the Owner, as well as the care and maintenance of the Cemetery. Their purpose is to make and keep it a beautiful and orderly place, where in dignified quiet we may visit the resting place of our deceased. These “Conditions and Restrictions,” along with the “Rules and Regulations” of the Cemetery, have been formulated after much careful consideration and long experience. They are for the benefit of Owners, both individually and collectively. It is expected that they will be duly appreciated and properly respected. Individual rights and preferences must be subject to them, if harmony and decorum are to prevail in the Cemetery. Each and every location shall be used solely for the purpose of interment of the remains of human beings. No location shall be used for any other purpose. The Cemetery shall have the right at all times to enter upon each and every location for the purpose of maintaining, cleaning and policing the same. *Interment Right Owner. It is important to note that when you purchase Cemetery “property” you are purchasing interment/burial rights only. The Cemetery always continues to own the property/property rights and can, therefore, govern the use of the property. Interment Rights do not imply or include normal property rights. Markers must be of granite or bronze with a granite backer. All flat markers are to be set flush with the ground. All Granite Markers must be between 4 inches and 6 inches thick. Adult Single Markers must be 12 inches minimum in Width and 24 to 34 inches in Length. Infant Markers must be 8 inches minimum in Width and 16 inches minimum in Length. Companion Markers must not exceed 80 percent of the combined width of the graves. Monuments must be of granite. Marble monuments are not permitted. Monuments may be placed in the monument space adjacent to any single or multiple graves if the graves and monument space have common ownership. Inscriptions of family names and individual names are only permitted over owned graves. Extensive inscriptions other than names, such as designs or poems, must be submitted to the office in writing for approval by the Management. Base Height must be 8 inches minimum. Base Length must not exceed 80 percent of the length of the monument space owned. Base Length on single graves must be 32" or 34". Base Width must be between 12 inches and 24 inches. Tablet Thickness must be 8 inches minimum. Tablet Height must be 22 inches minimum. Bases are not required for slant markers, but will be permitted. Single slant markers must be 24 inches in length, 10 inches in depth and 16 inches in height minimum. Double slant markers must be 36 inches in length, 10 inches in depth and 16 inches in height minimum. Each must have a polished face, "Rock" sides, and rock front nosing. No trees or shrubbery shall be placed upon or removed from any location by the Owner. Only trees approved for planting under the Memorial Tree Program will be permitted. 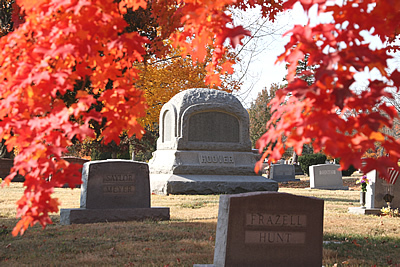 All trees and shrubs planted are the property of the Cemetery. No planting is permitted on graves or walkways. 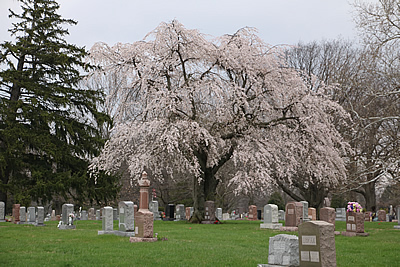 The Cemetery will not be responsible in any way, and reserves the right to remove, any trees or shrubs that have been planted by the Owner without Cemetery approval. 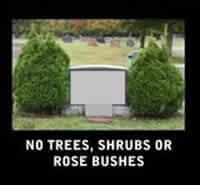 Overgrown or dead trees, shrubs or plants may be removed at the discretion of the Cemetery. No items shall be affixed to or hung from any tree or shrub. The Cemetery is not responsible for damage or loss of any plants, vases, glassware, crockery, trees or shrubs. Any unauthorized person found removing plants or any other decorations or damaging property on the Cemetery grounds will be prosecuted to the fullest extent of the law. 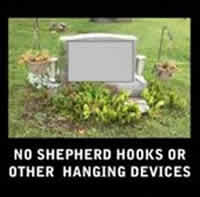 All shepherd hooks or any other plant hinging devices are prohibited. Flowers, ornaments or other objects, not included in the list below, will be permitted within 12 inches of the owner's side monument until the same becomes withered, soiled or unsightly. In case of the failure of the Owner to remove any such flowers or other unsightly objects, the Cemetery shall have the right to remove the same. Flowers, ornaments and other objects must be within twelve inches of the owner's side of the monument. No decorations are permitted on the sides of any monument, other than in vases that are part of the monument. Banners, pendants, pinwheels, balloons, glass or porcelain or other breakable materials are prohibited. No mulch, gravel, stone of any kind, fence, coping, ditch, hedge, trellis, post, chain, railing, step, border, shells, wire arches, advertisements in any form, vehicles of any character, glassware, boxes containing artificial wreaths, or enclosures of any kind shall be put or placed at any location by the Owner. Flag holders must be placed within 12 inches of the monument. Flags may be no larger than 12 inches by 19 inches on a 30-inch pole. Artificial flowers, designs or wreaths may be placed on flat markers from November 30 to March 1. Flag holders, pots, wreaths, artificial flowers, etc., may be placed on the flat marker for Easter, Mother's Day, Father's Day, Memorial Day, July 4, Labor Day, Veteran's Day, and Thanksgiving. All of these items must be removed within seven days after the holiday or they will be disposed of. Cut flowers are always welcomed, providing they are not in any container or packaging. No items that impede the ability to safely mow directly over the flat marker may be installed. These include: plantings, edging, stones/gravel, mulch, fences, etc.